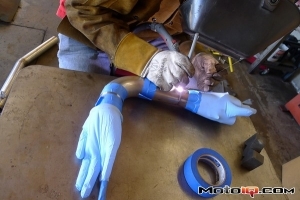 Homemade setup for back purging TIG welds consisting of rubber gloves taped to the pipe ends. Serves to prevent weld oxidation. Hi Tim, very neat idea but I was wondering if the pipe contained Argon or is it not needed in a short pipe. Thanks for the idea. (edited) Sorry Tim, I forget to hit the link that explains it all. Now I think it's a great idea!